This crunchy and sweet English toffee bar is chocolate covered to delight your senses. 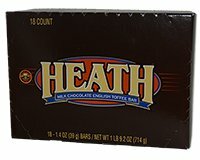 Carton Dimensions: 9 1/8" x 6 3/8" x 1 7/8"
Heath® is a Registered Trademark of and these bars are manufactured by The Hershey Company, Hershey, Pennsylvania 17033-0815 U.S.A. Ingredients: Milk Chocolate (Sugar, Cocoa Butter, Chocolate, Nonfat Milk, Milk Fat, Lactose, Soy Lecithin, Salt and Vanillin, Artificial Flavor), Sugar, Palm Oil, Dair Butter [milk], Almonds, Salt, Artificial Flavor and Soy Lecitin.